The United Nations General Assembly voiced concern over the Islamic Republic of Iran’s human rights record once again this week, voting to adopt a resolution presented every year condemning a range of human rights violations in the country. This is the fifteenth year in a row that the UN General Assembly, condemns Iranian government’s human rights record and calls on Iran to adopt long-awaited reforms to align its legislation and policies to some of the most fundamental human rights standards. The UN General Assembly expressed serious concern over a range of issues including the high number of executions in Iran and the ongoing severe restrictions placed on freedom of thought, conscience, religion and belief, amid acknowledgement of progress in other areas of concern. This includes improvements in the number of women represented in government, attempts to reduce the country’s staggering execution rate – 483 as of end of November – and Iran’s efforts to host large numbers of Afghan refugees. 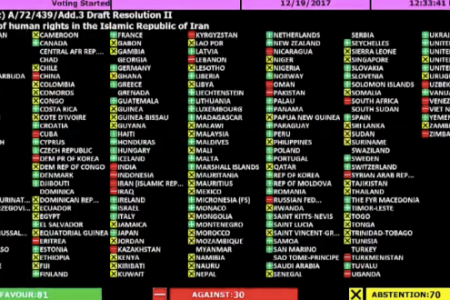 The resolution also “strongly urged” Iran to end its “discrimination and other human rights violations against persons belonging to ethnic, linguistic or other minorities” both in law and in practice. “The international community’s continued support for the rights of ethnic minorities in Iran gives us hope that the situation could one day improve” said Shahin Helali Khyavi, Director of the Association for Human Rights of the Azerbaijani People in Iran (Ahraz). Eighty-one countries from all regions have voted in favor of a UN human rights resolution (A/C.3/72/L.41) on Iran on December 19, 2017. Thirty member-states voted against the decision, and seventy abstained. Most of the states opposing the resolution are states that have a general position of hostility towards resolutions on human rights in specific countries, in the name of national sovereignty or other principles.